We Teach High School: Classroom Decor!! Let's face it, we've all heard the research based classroom decorating tips. Unfortunately, the research on lighting and colors that are best for a conducive learning environment tend to differ with each new school year. I've come to realize that every teacher is different, therefore, what works for the classroom is not uniform for everyone. For my decorations, I did decide to go with multiple colors. In the past I have kept my room in school colors, red and white, but I got bored with that after five years of the same thing. So this year I decided to make it more colorful. I bought this colorful chevron material from Hobby Lobby to cover my bulletin boards. I always trim my bulletin boards in ribbon. 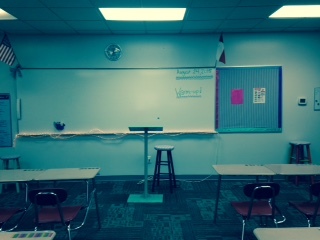 I feel that the teacher boarders are a little elementary, and ribbon is more plain. Plus, at Hobby Lobby you can find any ribbon imaginable to go with your theme! My bulletin board outside the room is typically used for some encouragement, as well as an introduction to what my class is. I used this We Are theme that I found from Pinterest a few years ago. I did this same theme last year, but with a different color scheme. 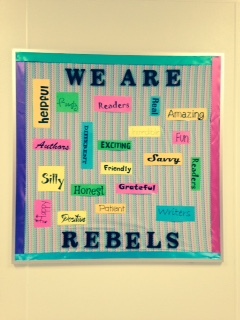 Since I am an English teacher, it has things like "we are...authors, readers...," then at the bottom it has our school mascot, REBELS. 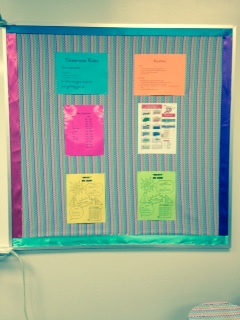 My inside bulletin board is used for rules, schedules, and classroom routines. I wrapped two of my stools in ribbon.I only did this for two of them because it was too expensive to continue. I found it was MUCH cheaper to spray paint, so with my two remaining stools that is what I did. 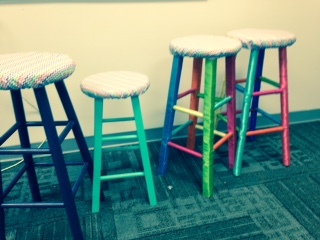 I used left over material from the bulletin boards to make seat covers for my stools. (I cannot take full credit for this because my grandmother did the work- I don't sew!) The material was cut in a circle- we did the size of the stool, plus a couple inches. The extra inches allowed us to fold the material under and place an elastic strip under the fold. I also down-sized my podium because my wooden one was taking up too much space. 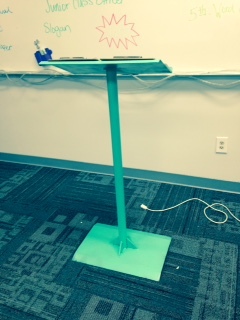 I have a simple metal podium now and I spray painted it to make it match. For lighting this year, I plan to use the typical fluorescent ceiling lights for most days. 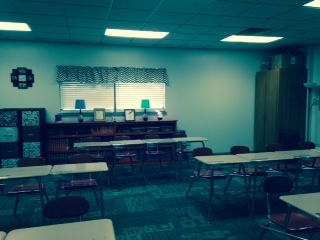 I did accessorize the room with lamps that I can use one days that we will be using the projector a lot, or for the Edgar Allan Poe reading days! I also accessorized my board with rope lights that I plan to plug in each day to make it a little brighter in my room! Smell- I plan to keep an Airwick plug-in the entire year! 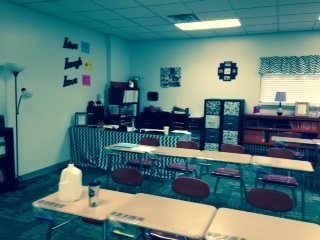 Students love when my room smells good, and so do I! However, in the past I have failed to replace them when they run out. This year will be different!! These student folders have been a life-saver!! Each student of mine has their own individual folder that will stay in class. They pick up their folder each day upon entering the classroom. Inside the folder is a calendar of events and lesson plans, this also includes upcoming projects, tests, and deadlines. I store learning and personality styles in the folder, as well as tests. Since I am an English teacher who uses the A.R. program, I also keep their A.R. testing record, reading level, and book logs in the folder. The best part about these folders is that they are perfect for parent-teacher meetings!! 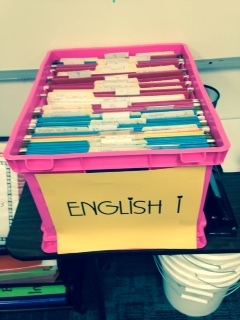 It is so easy to keep up with student information if they each have a folder. Student table- This table is for the students. On this table they will find their personal folders that I spoke of earlier. They will also find the work they missed while they were absent. I keep a folder for each day of the week and place work in the folders daily. 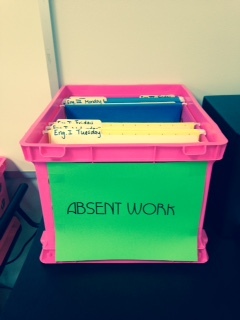 The students know to go to that folder to pick up what they missed. The table also includes supplies they may need including scissors, markers, crayons, tape, and staplers. The student table keeps them away from my desk and away from my personal supplies. 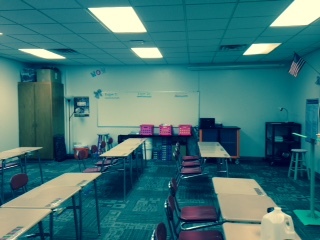 I have arranged my desks so they are in small groups, but they are all facing the front of the room. 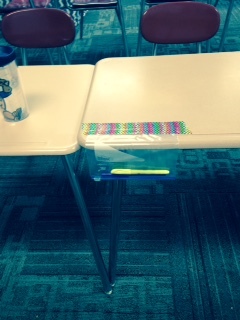 I have used Duct tape to attach zip lock bags on each desk that include a pen and a highlighter. I'm hoping this will alleviate them coming to class without supplies problem. I have a ziplock bag taped to each desk that includes a pen and a highlighter.